Join the Downtown Utica Red Zone Hospital Discussion on Facebook. We are looking at the added Risks of railroads and the downtown concept site. Required hazard mitigation and efforts to reduce risks to hospitals makes the Downtown Utica an undesirable location. 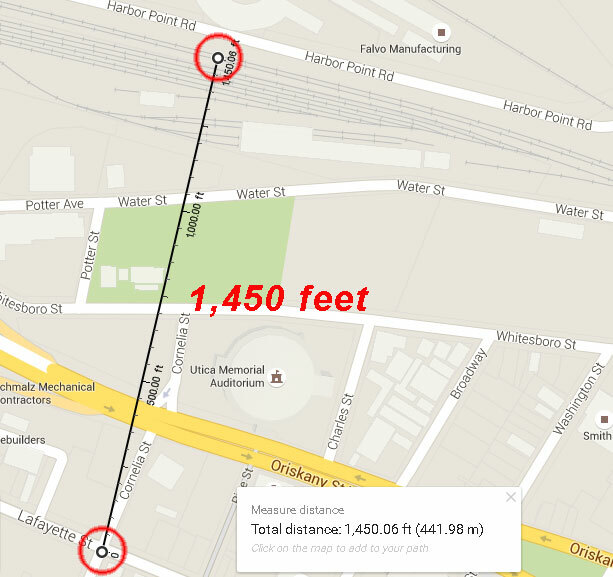 The downtown site is just 1,400 feet from one of the Northeast's busiest freight railroads, which carries the Inherent Risks of a railroad and Warnings Have Been Well documented, even by our local newspaper, the Utica Observer-Dispatch. We're tracking Upstate Train Derailments. Learn more about Anthony Brindisi. 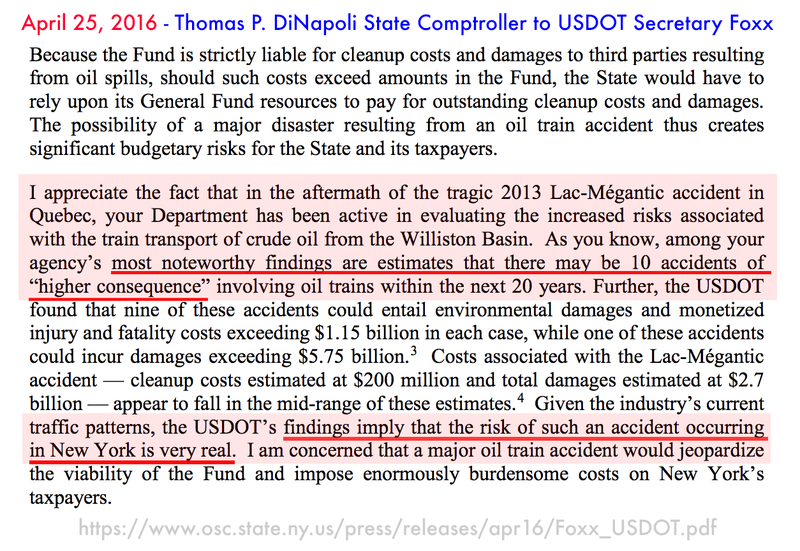 Upstate New York facts prove that railraod derailments are common and very destructive. In fact, one need only to look to 2007 in Oneida, NY, Freight Train Derails And Explodes In Central New York. Hospitals & @CSX tracks DON'T mix! #NoHospitalDowntown ! ! ! Several others have already occurred across the county since New Year. We're logging them here: Utica NY Group Logs Regular Occurrences Of Train Derailments. Since October 6, 2017, #NoHospitalDowntown has been tracking derailments within the United States (and a few others) on Facebook, see Utica NY Doesn't Want A "Red Zone" MVHS Hospital! Why place a critical community resource into a higher risk zone, when accidents are frequent occurrences. Consider this Derailment & Fire. Why is @MVHealthSystem stating “no alternative” in their #SEQR #DEIS? Today in #csx #mvhshealthreport #mvhsdowntown news... https://t.co/6dC87MdpEq Hello @HealthNYGov @DickGottfried @NYGovCuomo ? We've Investigated Past Downtown Utica Train Derailments. August 16, 2018 - We've alerted our leaders, the media, and many others, and try one more time with the Utica Observer-Dispatch. "New York’s hospitals and health care systems are a critical element within the disaster response system. IHA works to help ensure our member hospitals and health systems are prepared to respond to any potential threats to public health." So why place Utica's new and would be only hospital into an area that would become an evacuation zone? The Utica tracks Carry Many CSX Trains Transport; Chemicals, Gas, & Oil Tanks. Many are 100-car long trains traveling 55 mph. The short distant between the proposed downtown site and these tracks, means a new hospital would be in a "Red Zone", also known as the "blast zone". Check for yourself; "select and copy" this address - 400 Lafayette Street, Utica, NY 13502" - and "paste" it into the "Find an address" box on this page: Mapping risk by rail transport. Dear @SenSchumer @NYGovCuomo @DickGottfried @ABrindisiNY @MayorPalmieri @AJPicenteJr @SenGriffo the #mvhsdowntown is a VERY BAD hospital concept https://t.co/DgyeaXgKje please consult w/ @USDOTFRA @CSX @ahahospitals & insurance / safety professionals! April 5, 2018 - Caller asks question about CSX tracks and proposed hospital... MVHS Officials discuss recruitment, update property status of downtown site. Mr. Scholefield incorrectly states that trains pass by downtown at a slower speed. Next he further attempts to play-down the risk, saying tracks are "...like all our other hospital risks and they would just use their evacuation plans... and they can shut-off air intakes if there was an explosion." Poor and uneducated answers! Not very smart people, that's all we can say. 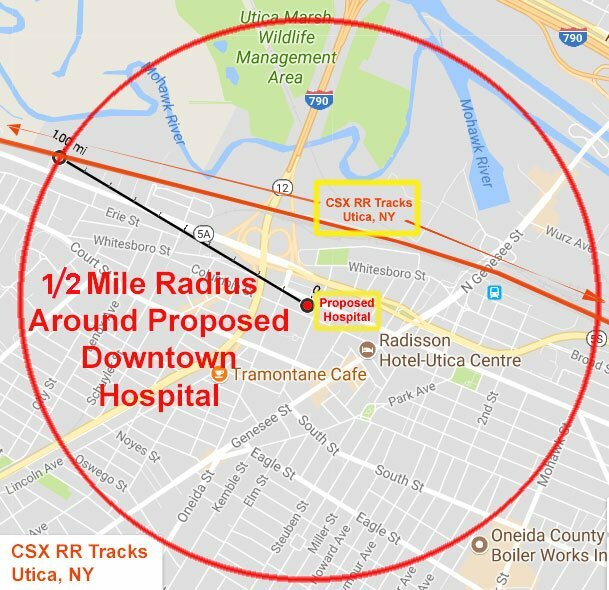 March 15, 2018 - Yesterday freight train derails, Route NY 5s closed, same CSX mainline passing with 1,500 feet of proposed Downtown Utica hospital site, which is a Red Zone!!" Train hits truck carrying hydrochloric acid in Pennsylvania, evacuations ordered https://t.co/2ENmAWlFCH Meanwhile @MayorPalmieri @ABrindisiNY @AJPicenteJr @SenGriffo say okay to place Oneida County's new @MVHealthSystem into @CityofUtica "Red Zone"! March 1, 2018 - Earlier this month Utica-area politicians state rail safety must be invested in, "...federal funding for vital programs to upgrade rail infrastructure and safety, at a time when these improvements are urgently needed." February 15, 2018 - Just too common, and certainly very unwise to place new Oneida County, Utica's only hospital, so close to our CSX mainline. Sadly news of train accidents are regular occurrences https://t.co/0XVSg7qA2l please note proposed #mvhsdowntown @MVHealthSystem hospital in downtown @CityofUtica is a "Red Zone", under 1,500 feet to northeast's @CSX freight & @Amtrak lines. Elected officials cannot explain-away the facts. For example on February 1, 2018, Mr. Brindisi stated "... the exterior of the downtown hospital would be flame proof..", this is plainly absurd! 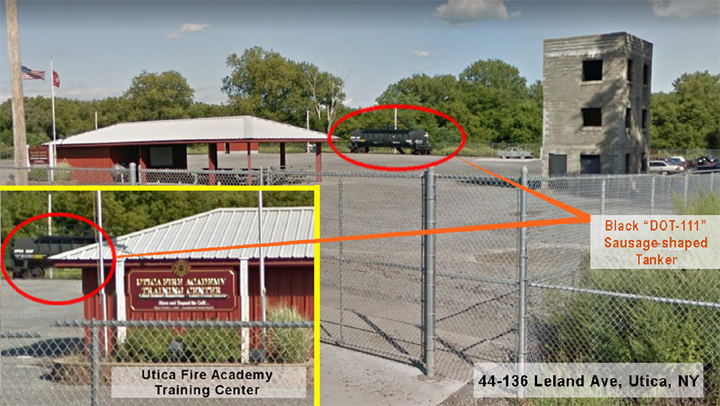 Also, Oneida County has trained for very real oil tank hazmat derailments, view the City of Utica, Leland Avenue, Fire Department (DOT-111 Railcar Tanker) Training Center. 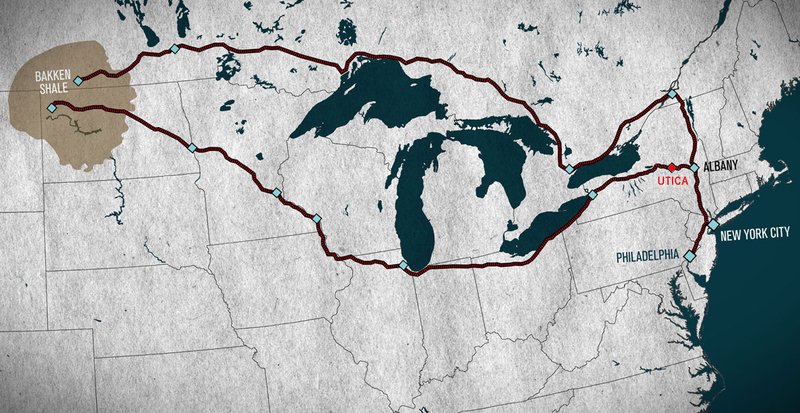 Also read article that states, "These same trains pass through other major cities in Western and Central New York, including Buffalo, Rochester, Syracuse, and Utica." December 19, 2017 - "Don't be alarmists", and "When has a train derailed and Downtown Utica ever been evacuated?" Not the case at all... we're just stating a fact; the downtown site is very close to the Northeast's busiest rail corridor, while St. Luke's is on a distant green hill. Accidents continue to happen. Just yesterday in the early morning hours, how many people stayed home in Seattle because they though their train would derail? No fabrications; and as shown here OIL TRAIN EXPLOSIONS: A TIMELINE IN PICTURES where is states, "Ten explosions in two years, and no end in sight." Derailment dangers, the noise, what are these people thinking? Just 1-3/4 miles away there is 64-acres, so What's So Wrong With St. Luke's? December 3, 2015 - Local news broadcast by Keith Hunt of News Channel 2, shows local Utica Firefighters training to extinguish a tanker train fire, watch his video Tanker Trains. Closing comment by then Chief Russel Brooks, "...were one of these fires to occur in this area, it probably would be beyond our capabilities." 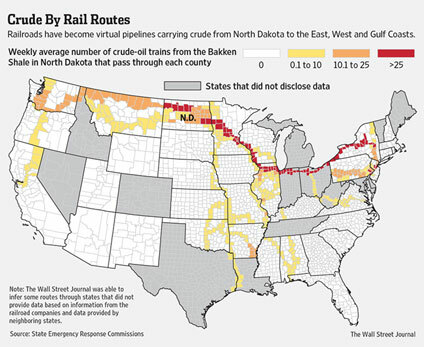 Where are the oil trains coming from and going? View a map of the Bakken Shale Delivery Route Through Utica. What is the Bakken Shale? "...is one of the largest (possibly the largest) continuous oil accumulations in the world." A train's tanker cars carrying oil from the Bakken Shale formation have traveled around 2,000 miles before reaching Utica. Failures of equipment are hopefully found early, but there are risks with such long journeys. Read October 6, 2017 comments from the #NoHospitalDowntown group on Facebook. Also this Breaking News: CSX train derails and Hits house in Northwest Atlanta... "I wouldn't want live that close to the tracks as much as I have a love and fascination with trains..."
August 2, 2017 - Today a freight train derails before making New York State. According to this story, Pennsylvania town evacuated after train carrying hazardous materials derails, the train was headed towards Albany's Selkirk Rail Yard. View our interactive Upstate Train Derailment map. 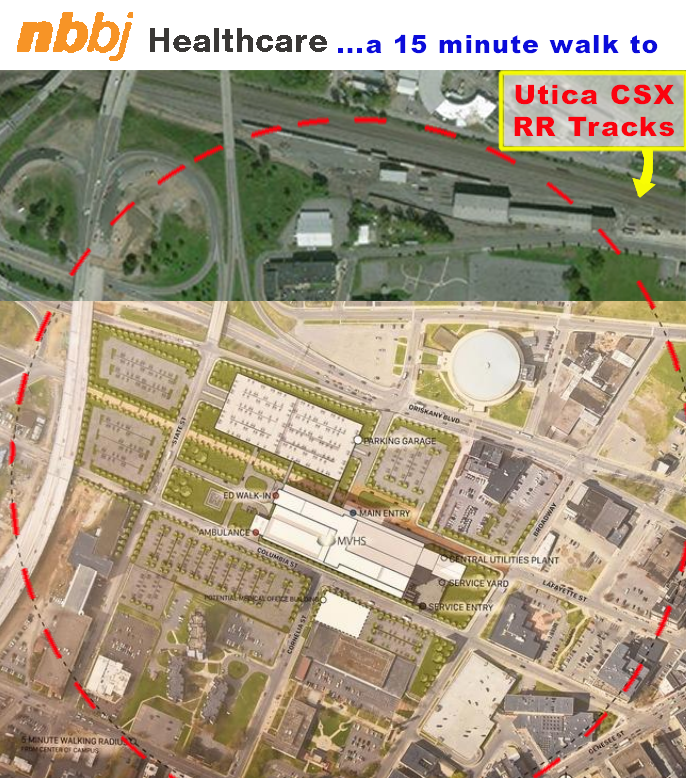 March 8, 2017 - Proposed Downtown Utica hospital site just 1,400 feet from CSX railroad tracks! Today Utica has three hospitals, St. Luke's is part of a medical district near Utica College. It shares a modern $15 million dollar co-generation power plant, a "green" micro-grid. St. Luke's has lots of room, 64-acres, enough space to Keep the St. Luke's home & Construct Eight Hospitals. And as you can see, they could Build a new hospital & medical office building, while the current hospital continues to function. Why bulldoze Downtown Utica as many new developments are taking place? With Nano we will create even more demand for a vibrant urban city downtown. This, and Utica has Faxton Hospital expanding services, it just doesn't make sense. Looking back to January 28, 2014, Governor Cuomo signs Executive Order 125 to, Take Action to Strengthen the State's Oversight of Shipments of Petroleum Products. "Whereas, the increase in frequency and numbers of rail cars, ships, and barges carrying crude oil and other petroleum products through hundreds of New York communities increases the public's vulnerability to a serious accident..."
Search for listing of Governor Cuomo's Latest Round of Rail Inspections. April 10, 2016 - Of Trains & Hospitals Over the weekend someone from the medical community pointed out to #NoHospitalDowntown that the proposed downtown hospital would place the new hospital within 2,000 feet of the heavily used railroad tracks. It was further reported that in the event of a train derailment carrying toxic materials, a certain radius around the crash site would need to be evacuated (for example, 2015 Tennessee train derailment). If this were to include the new hospital, a compound problem would exist; the hospital might need to be evacuated, yet potential accident victims would be seeking care at the hospital. "Late Tuesday evening, I directed the State Police, Division of Homeland Security and Emergency Services’ Offices of Emergency Management and Fire Prevention and Control as well as the Department of Environmental Conservation to respond to a 16 car train derailment on the Norfolk Southern line in the town of Ripley, NY in Chautauqua County. Two of the rail cars contained ethanol which leaked causing an evacuation of surrounding homes in the area as an emergency precaution..."
Accidents happen, and who would have thought that our very own modernized Union Station would be struck by a train? Well it did occurred, for the story: Investigation continues after Union Station train crash, plus Video of Runaway Rail Car Crash in Utica. Looking back, a 2013 article revealed: "Nobody inside or outside the industry you can find who will actually speak in defense of the current rolling stock," says Lloyd Burton, who studies rail transport of hazardous materials at the University of Colorado. In 1991, the Federal Transportation Safety Board called these tankers “inadequate.” As recently as 2012, the NTSB said they have a “high incidence of tank failure” (PDF, see page 5). The DOT-111 is the black sausage-looking tanker that blew up in Lac Megantic, Quebec. Learn all about New York State Freight Rail on their information page. Federal Railroad Administration (FRA), on Facebook at #USADOTFRA, and on Twitter @USDOTFRA. Federal Transit Administration (FTA), on Facebook #FTADOT, and on Twitter @FTA_DOT. Association of American Railroads (AAR) on Facebook at #FreightRail, at Twitter @AAR_FreightRail.